A broken shoulder is usually caused by a fall on to an outstretched arm. 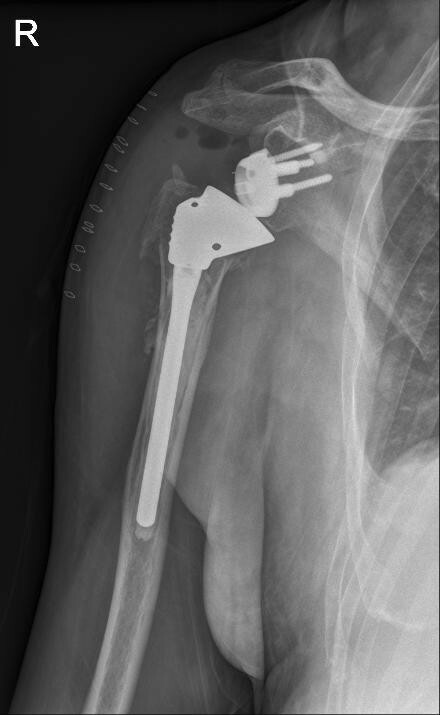 Another name for it is a: Proximal humerus fracture. Fractures involving the shoulder joint are common, especially with sports accidents and among the elderly (in the context of osteoporosis). Excruciating pain and often deformity. Conservative treatment: Most shoulder fractures (80%) do not move much and can be treated conservatively (non-surgically). This is particularly true for children. This treatment consists of rest, wearing a sling, taking painkillers for a few weeks, followed by careful physiotherapy. Development: One week later another assessment is carried out to establish whether the fracture components are still in place. If the situation is satisfactory, the treatment can continue. It is important to move the shoulder as quickly as possible and begin rehabilitation to prevent stiffness. If the pain allows it, these exercises can already be performed after the first week. Physiotherapy is generally started around three weeks later. Recovery takes between three and six months. Despite a good recovery the shoulder joint often gets stiff and this can drag on for several months. It can usually be relieved by physiotherapy. Surgical treatment: If the bone fragments have moved too much the joint will not heal completely, resulting in permanent loss of function and pain. In this case the decision will be made to operate. 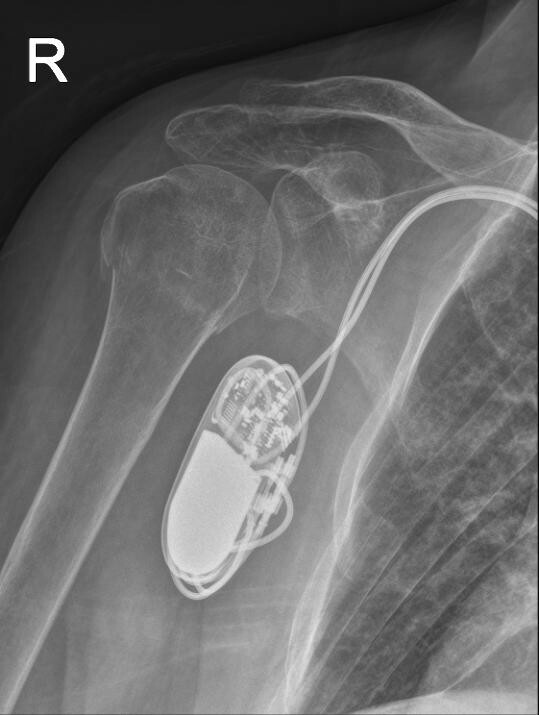 The nature of the procedure largely depends on the type of fracture concerned, the vascularisation and taking into account the patient’s age and bone quality, functioning of the shoulder before the accident, especially related to the rotator cuff muscles. 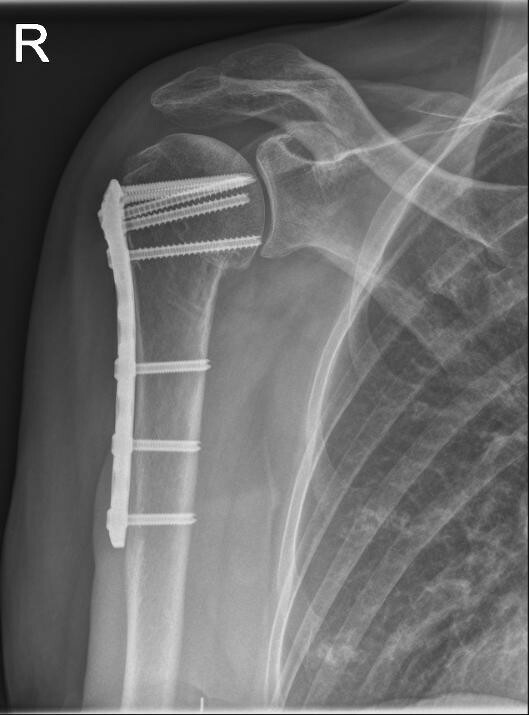 Results: Results following surgical treatment of a shoulder fracture may vary significantly. A painless and functional shoulder is usually achieved with which the patient can feed and wash him/herself and perform most daily activities. Complications involved in the treatment are possible, but are fortunately rare. The most common are: infection, bleeding, the fixation material or prosthesis coming loose, the fracture moving to an unacceptable position, a stiff (and non-functional) shoulder, damage to the nerve, blood vessel, tendon or muscle. The end result will not only depend on the treatment and rehabilitation, but also the patient’s age, lifestyle (smoking, alcohol consumption), bone strength and general health. Recovery: The recovery period following a fracture of the shoulder still takes many months (three to six months). It consists of a long-lasting exercise programme and physiotherapy. Each case must be assessed individually and solutions tailored to the patient must be sought.